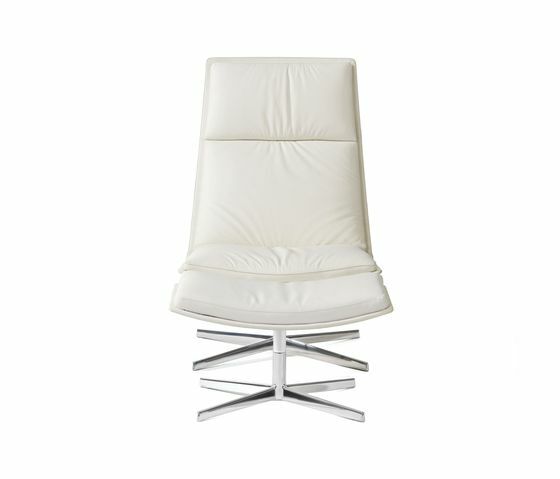 Chair with four way base in polished aluminium, equipped with return and tilt mechanisms, and polyurethane shell upholstered in leather, faux leather, fabric or customer’s fabric. Available with or without armrests. With its generous dimensions and distinctive, formal yet stylish design, the Catifa 70 chair is another variant on the Catifa system. Distinguished by its light but clearly defined lines, its shape adapts beautifully to lounge settings and domestic situations. Catifa 70’s padded shell is covered in leather, fabric or customer’s own fabric. It comes with a choice of bases: swivel in shiny aluminium, sled, or rectangular in a range of colours. The central pedestal version can be fitted with a tilt mechanism and covered armrests. A matching footstool is also available. The new Catifa 70 Soft is designed to offer an experience of pure comfort. The clean lines of the classic Catifa 70 Lounge have now been fitted with three large soft upholstered cushions that - together with the tilt mechanism and the footstool – guarantee maximum comfort. Catifa 70 Soft can be upholstered in leather, fabric or customer’s fabric. Shell is made of structural polyurethane while the polished aluminium four way base is equipped with return and tilt mechanisms. Catifa 70 Soft is available with or without armrests.